I’m not a big fan of other vacation spots, although the rocky coast of Maine was a big winner, too. And having grown up with family that owned a home in Florida, I’m a big fan of anything Disney, along with Busch Gardens, Alligator Land and Universal Studios. I’ve even been lucky enough to visit Disneyland in California. I was only about 8 years old at the time, and only remember riding the Matterhorn with Grandpa Bowman. I also have memories of the San Diego Zoo, and I’ve been in love with zoos ever since. Toronto was another great place to vacation. Everything about it was great. The drive there through wine country in New York and northeast Ohio; all the bridges we crossed to get to Toronto, The CN towner and especially the ethnicity of the area of Toronto we visited. That was probably my favorite part of Toronto. Plus, I saw “The Lion King” on stage there. It was my one and only “Broadway” plan. If I don’t see another, I’m OK with that, because the spectacle that was “The Lion King” was an experience I’ll never forget. But as much fun as I love getting away from Ohio every now and then, I’m always going to come back to the Buckeye State. Ohio is my home. And unless I find a lucky lottery ticket and can afford that home on the beach in Nags Head or Key West, this will always be my home. Last week’s wacky weather is one of the major reasons I love living in Ohio. I’m a big fan of thunderstorms. They fascinate me. I like trying to predict them. I enjoy watching them approach on weather radar and I love sitting on my front porch or in the back yard in the spring and summer — or in late February — and watching the clouds and wind and rain approach. If I had to do my life over again, I’d be working at the Weather Channel. I’d be one of those idiot weather guys who report from the shores of the Atlantic and Gulf Coast as a hurricane gets ready to roll ashore. I also might be one of those storm chasers who spend the spring and early summer chasing severe storms from Texas to the Dakotas. But without that job with the National Weather Service or the Weather Channel, Ohio is the next best place to be. 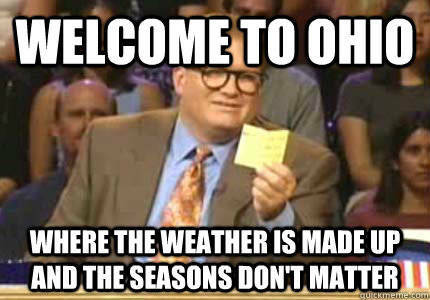 It’s been an odd winter in Ohio. This weekend was perhaps as wacky as it can get. It was warm all week. We had highs in the 5os and 60s. Golf courses were open. I actually saw someone at Amann Reservoir asleep on a lawn chair one afternoon. I should have honked to wake him up, but a February sunburn is kind of something to brag about. Sitting at home on Thursday night, I actually killed a mosquito … in Ohio … in February … after it landed on a page of the Tom Clancy novel I was reading. I’m not certain what that means for the bugs in Ohio this summer, but I’m going to load up on insect repellent for me and flea powder and flea meds for my dog and two cats. Speaking of bugs, does anyone else long for the days when lady beetles were the scourge of Ohio homes in the winter? I long for a lady beetle infestation. At least they eventually died away … unlike Ohio’s newest scourge, the stink bug. What’s up with these creatures? I believe they’ve taken over the top of the survival chain from the cockroach. If there is a nuclear war, I’m confident stink bugs will be the new masters of this planet. I don’t know where they nest. I don’t know why they are so abundant this year. I only know that daily I catch three or four of them with a paper towel as it crawls up a kitchen cabinet. Once a week or so, I don’t find any stinkbugs in the kitchen, but I know throughout the evening they’ll be buzzing around the ceiling fan driving my pup nuts. As I sit and type this in my living room on Saturday evening, I see three of them on the ceiling. It’s a high ceiling and I don’t feel like knocking them down with a broom today. But I’m confident they’ll still be there tomorrow. Anyway, back to Ohio’s weather. It was almost 75 in Galion on Friday. Then some weather blew through. The storms were strong. I wouldn’t call what rolled through Galion severe, but the weather experts may differ. I know the change in air pressure and the low rumble of thunder is not something my pitbull Beatrix likes. Her favorite spot on earth is next to me, wherever I am. But when a thunderstorm is approaching, she finds a table in a corner to hide under. So, the storms rolled thought. Beatrix and I both get up in the middle of the night on occasion. My cats have decided they like a snack between 3-4 a.m. most nights. And yes, I spoil them. And on Saturday morning, I even took Beatrix out at 4:15 a.m. I had to put shoes on, but still it was doable in shorts and a t-shirt. At 8 a.m., when we got up for good, I had to throw on a jacket and a cold wind was blowing through Galion and the temperature was probably in the low 40s. I went to Mansfield around 10 a.m. and the temps had dropped to the upper 30s. On the way home there was sleet and then a pretty good snow squall. I just took Beatrix out again at 9 p.m. and there is actually snow sticking on my back porch and on the grass, although I doubt it will stay long. That’s the kind of thing that makes Ohio a great place to live. If you don’t like the weather, just wait a day, or a few hours, and it will change. I love the fact we can experience all four seasons in a span of about 48 hours. It’s about 9:30 p.m. The thermostat is reading about 60. I keep turning it on and I hear the furnace kick on. But it’s a bit chilly in here right now. But that may just be a relative thing, seeing as how just 24 hours ago I was sitting in this same spot, with a pair of gym shorts on and … well not much else. Fortunately, when I go to bed tonight. There will be a 55-pound warm-blooded puppy asleep next to my head, a cat on the other side of my head and another one on the corner of the bed. I think that one is protecting me from a particularly persistent stink bug. And by the time you read this Wednesday, the weather-guessers say we’re due for some more temps in the 60s, another round of storms, and then falling temps. God, I love this place! Russ Kent is editor of the Galion Inquirer, Bellville Star and Morrow County Sentinel. Email comments or story ideas to him at rkent@civitasmedia.com.